Noravank (meaning “New Monastery”) is a 13th-century Armenian monastery, located 122km from Yerevan in a narrow gorge made by the Amaghu river. The gorge is known for its tall, sheer, brick-red cliffs surrounding the monastery. Noravank was founded in 1205 by Bishop Hovhannes, a former abbot of Vahanavank and became the residence of the Orbelian princes. The architect Siranes and the miniature painter and sculptor Momik worked here in the latter part of the thirteenth and early fourteenth century. 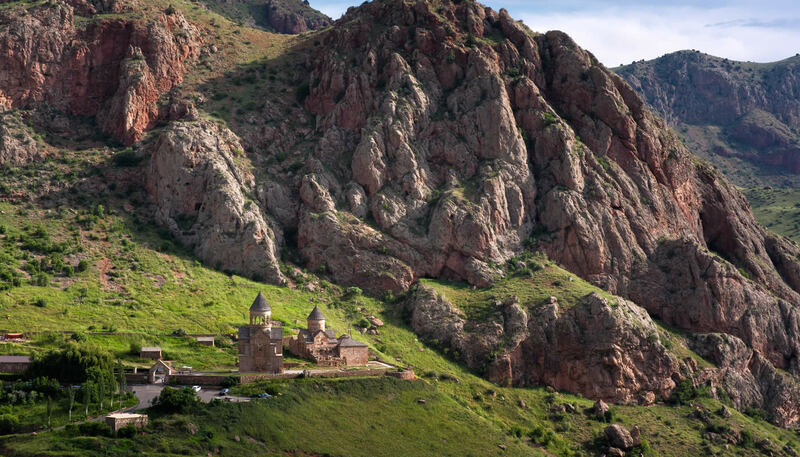 In the 13th and 14th centuries it became a major religious and cultural center of Armenia. The grandest structure is Surb Astvatsatsin (Holy Mother of God), also called Burtelashen (Burtel’s construction) in the honour of Prince Burtel Orbelian, its financier. Surb Astvatsatsin was completed in 1339, a masterpiece of the talented sculptor and miniaturist Momik, who designed it, and was also his last work. The ground floor contains elaborate tombs of Orbelian Princes and their family. The complex has several surviving cross-stone (khachkars). The most intricate of them all is a 1308 khachkar by Momik. Standing out against the carved background are a large cross over a shield-shaped rosette and salient eight-pointed stars vertically arranged on its sides. The top of the khachkar shows a Deesis scene framed in cinquefoil arches symbolizing a pergola as suggested by the background ornament of flowers, fruit and vine leaves. The complex was renovated in the late 1990s and early 2000s under the sponsorship of Mr. & Mrs. Hadjetian.